Besides daily hygiene and regular dental visits, the best thing you can do for your kids' dental health is to see that they're eating a nutritious diet. And not just at mealtime—healthy snacking also promotes healthy teeth and gums. Healthy snack foods are quite similar to their counterparts at mealtime: fresh fruits and vegetables, whole grains and low-fat dairy. At the same time, you should avoid providing processed snacks high in sugar, salt, unhealthy fats and calories. Managing snack choices at home is usually a simple matter of discipline and follow-through. When they're at school, however, it's a bit trickier as they may encounter snacks sold on school grounds or offered by fellow students that don't meet your definition of a healthy food. 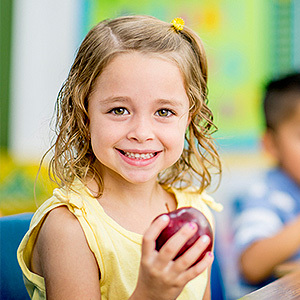 Public schools follow nutrition guidelines from the U.S. Department of Agriculture (USDA) on snacks sold on school grounds, but many dentists don't believe the standard goes far enough to protect dental health. So, what can you do to combat these less healthy snack choices your kids may encounter at school? For one thing, you can work with your child's school officials to exceed the USDA guidelines or turn off snack vending machines right before lunch to lessen kids' temptation to skip lunch. You can also interact with your children to better manage their schooltime snacking. But rather than issue blanket commands about what they should snack on at school, help them instead understand the difference between nutritional foods and less nutritional ones, and why it's important to choose healthy snacks for their life and health. Finally, don't send them to school empty-handed—pack along nutritious snacks so that they won't seek out vending machines or their classmates to satisfy the munchies. You can supercharge your efforts with a little creativity (like a dash of cinnamon in a bag of unbuttered popcorn) that make your snacks fun and more enticing than other school ground options. It's not always easy to keep your kids from unhealthy snack choices. But with a little commitment, interaction and ingenuity, you can help steer them toward snacks that are tooth-friendly.